To decorate: 1 untreated lemon, chopped toasted nuts. 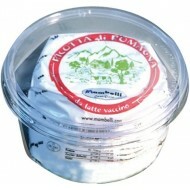 Mix ricotta with sugar, vanilla extract and chopped mint. Add grated lemon zest and puffed rice. Peel kiwis and cut them into slices. 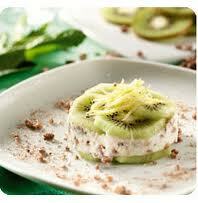 Put the kiwi slices on the bottom of a round pastry ring, fill with ricotta of romagna and finish with another layer of kiwi slices lightly superimposed. remove from the mould and serve decorating it with a little of lemon zest, grated à la julienne and with chopped toasted nuts.